This was the case at the Athletic Field House within the seven-school, 3,500-student Mequon-Thiensville School District in Wisconsin. According to Kyle Thompson, the school district’s Director of Facilities, the Field House contains four full-sized basketball courts, a regulation-sized track encircling them, and is in continuous use from 5 a.m.-10 p.m. every day. 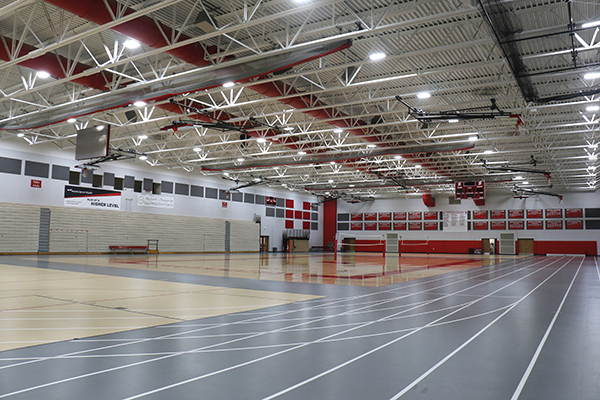 To help reduce energy costs given its long operating hours and large space, Thompson recently oversaw the replacement of the Field House’s outdated fluorescent T5 High Output fixtures with LED High Bay fixtures from Litetronics. This switch successfully slashed energy costs and consumption by nearly 45% while delivering “a brighter, whiter, and better-lit space,” said Thompson. But while the LED upgrade improved visibility and ambiance for all occupants, it also put school staff and students at ease with enhanced security and better-quality surveillance footage. We monitor four security cameras in the Field House at all times and our LEDs have delivered an important new safety benefit in that the lights kicking up to full power alert us to people walking through that space and give us full visibility to their activities, said Thompson. “This has helped us boost security measures and provide a safer environment for students and faculty alike." For these reasons, it behooves school administrators and business owners to consider upgrading to LED technology. In addition to requiring no warm-up time, LEDs deliver greater coverage, uniformity, and consistency of light than conventional sources like fluorescent and HID. They also avoid quality issues like lumen depreciation, color shifting, and hot-spotting over time – all of which can impact the sense of safety and security occupants feel and experience in a space. Their bright, white light and uniform distribution has also been found to enhance the visibility and subsequent quality of security footage captured at schools and businesses which operate closed-circuit television (CCTV) systems or security cameras on their premises. In addition to the under two-year payback the Field House will enjoy on its recent lighting upgrade, its investment in Litetronics LEDs will also help ensure a safer and more secure environment for generations to come.